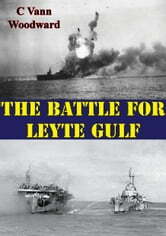 Pulitzer prize winning author C. Vann Woodward recounts the story of the largest naval battle of all time. 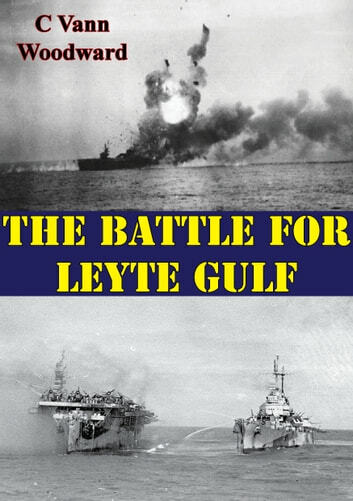 “The Battle for Leyte Gulf was the greatest naval battle of the Second World War and the largest engagement ever fought on the high seas. It was composed of four separate yet closely interrelated actions, each of which involved forces comparable in size with those engaged in any previous battle of the Pacific War. The four battles, two of them fought simultaneously, were joined in three different bodies of water separated by as much as 500 miles. Yet all four were fought between dawn of one day and dusk of the next, and all were waged in the repulse of a single, huge Japanese operation. “They were guided by a master plan drawn up in Tokyo two months before our landing and known by the code name Sho Plan. It was a bold and complicated plan calling for reckless sacrifice and the use of cleverly conceived diversion. As an afterthought the suicidal Kamikaze campaign was inaugurated in connection with the plan. Altogether the operation was the most desperate attempted by any naval power during the war-and there were moments, several of them in fact, when it seemed to be approaching dangerously near to success.